A rhythm platformer like its two predecessors. Your character runs automatically, you avoid obstacles and collect gold by jumping, sliding, kicking or blocking at the right time, and your actions affect the music. This third installment keeps the aesthetic from Runner2 and most of its additions (characters and skins to unlock, levels with branching paths, optional mid-level checkpoints, etc.) and adds several of its own including a double-jump and vehicle sections that control differently from standard running. Unfortunately, some of the new changes greatly damage the game’s core appeal. As a rhythm game with high challenge, strictness, and punishment, it’s important to minimize frustration and maximize flow, but Runner3 takes multiple steps backward in both of these aspects. 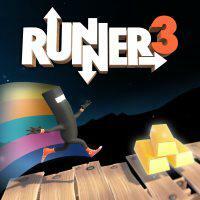 Runner2 allowed the player to tune the challenge with three difficulty settings for each stage; Runner3 launched without difficulty settings (but is apparently adding them in a future patch). It’s always been the case in Runner games that a single “bonk” (hitting an obstacle or falling into a pit) triggers failure, but in Runner and Runner2 this just quickly scrolls you back to the beginning of the stage (or, in Runner2 , the checkpoint if you’ve triggered it). In Runner3 , bonks also trigger a dramatic slowdown and the display of a running counter of bonks, rubbing your nose in it and disrupting the flow. This becomes aggravating when the bonk doesn’t feel like your fault due to decreased readability of cues. Some overzealous animations move parts of the level as you’re approaching them, making it harder to predict in time what you’ll have to do. Your increased movement options also make some cues more ambiguous - when there’s something to jump over, it’s not always immediately clear whether you need to do a quick jump, a floaty jump, or a double-jump (each half of which can also be quick or floaty). The vehicle sections also change up the way you play and are generally not bookended by checkpoints, meaning the punishment of a bonk is not scoped to the particular challenge or skill being tested. The result is a game that looks a lot like previous Runner games, but is much less satisfying to play with a lot of frustrating disruptions to flow. As such, I can’t really recommend this game. Runner2 is still the best Runner game. I Stopped Playing When: I got a couple levels into the second world and didn’t want to go any further because the ratio of frustration to flow was way too high. I probably would have quit earlier if this were my first Runner game, but I wanted to give it a fair shake since I’d liked the first two so much.